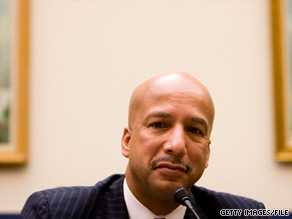 Former New Orleans Mayor Ray Nagin told CNN’s John King on Friday that he will not seek public office. (CNN) - Ray Nagin, the former mayor of New Orleans who was both praised and criticized for his leadership during Hurricane Katrina and its aftermath, told CNN Friday night that he will not seek public office again. Nagin was first elected mayor in 2002 and squeaked out re-election with a 4-point victory over Louisiana Lt. Gov. Mitch Landrieu in 2006, after Katrina. Due to term limits, Nagin could not seek a third term and stepped down from office in May. He drew heavy criticism when, in a 2006 speech on Martin Luther King Jr. Day, he urged residents to rebuild a "chocolate New Orleans" and said, "You can't have New Orleans no other way." 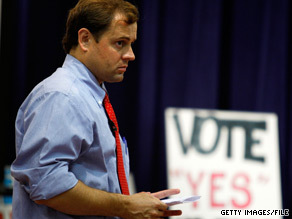 Virginia Rep. Tom Perriello called Friday for Treasury Secretary Tim Geithner to resign. Washington (CNN) - It's not just Republicans calling for President Obama's economic advisers to go. An embattled member of the president's own party has publicly called for the resignation of the top member of the administration's economic team. Rep. Tom Perriello, a Virginia Democrat, called for the resignation of Treasury Secretary Timothy Geithner at a town hall meeting in Ruckersville, VA earlier this month, according to Perriello spokesperson Jessica Barba. Perriello's move is emblematic of how–with the economy the biggest issue with voters–Perriello felt it necessary to distance himself from Obama economic policies. (CNN) - The winner of Tuesday's five-way Democratic gubernatorial primary in Vermont emerged Friday and the runner-up quickly called for a recount, with 197 votes separating the top two candidates. According to uncertified results released Friday by the office of Vermont's Secretary of State, Peter Shumlin has won the election with 18,276 votes. Doug Racine received 18,079 votes. Out of 74,634 votes cast, the 197 the separate Shumlin and Racine represent just one quarter of one percent. "That is less than one vote per town," Racine told reporters at a press conference Friday. "I've just spoken with Peter [Shumlin], and I told him I would be requesting a recount," Racine said. "Peter said he would support my decision." Who owns the civil rights movement? Washington (CNN) – Officials are scrambling to ensure that voting this fall will occur as planned in one Texas county after a fire destroyed $30 million worth of voting equipment early Friday morning. The fire in the Harris County Election Technology Center located in northeast Houston destroyed more than 10,000 pieces of voting equipment. The damage to the facility was so severe fire officials had to tear down the entire building, according to Harris County Clerk Spokesman Hector DeLeon. But DeLeon said they're working to guarantee a trouble free election despite the fire. "Our goal is still to conduct the election according to the guidelines," said DeLeon. The lost equipment included everything from voting booths to eSlates, a computer-based machine used for collecting votes. Is this the year of the independent? 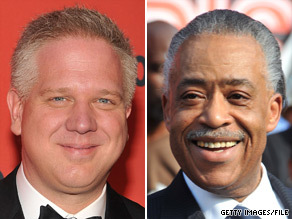 Glenn Beck and Al Sharpton are both holding rallies in Washington, DC on Saturday. Washington (CNN) - The planned large rally by Fox News Channel and radio talk show host Glenn Beck Saturday on the National Mall is causing controversy because of its location and timing. The timing is 47th anniversary of Martin Luther King's "I Have a Dream" speech and the location is on the National Mall in front of the Lincoln Memorial, where the civil rights leader delivered his historic address. Beck, a hero to many conservative voters across the country, says that the mission of the rally is to honor American troops and that the event is non-political in nature. A press release for the "Restoring Honor" rally says "this non-political event benefits the Special Operations Warrior Foundation and pays tribute to America's service personnel and other upstanding citizens who embody our nation's founding principles of integrity, truth and honor." Tea Party activists from across the country are expected to attend, and former Alaska Gov. Sarah Palin, a Fox News contributor, is expected to have a prominent speaking role. Housing and Urban Development Secretary Shaun Donovan revealed to CNN Friday that the Obama administration plans next week to unveil two new initiatives to deal with the crumbling housing market. 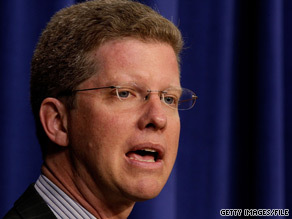 Washington (CNN) - Housing and Urban Development Secretary Shaun Donovan revealed to CNN Friday that the Obama administration plans next week to unveil two new initiatives to deal with the crumbling housing market, and he left the door open to also reviving the expired $8,000 tax credit for first-time home buyers that had been propping up the industry. This tweet was posted and then removed from Joe Miller’s Twitter account Friday afternoon. 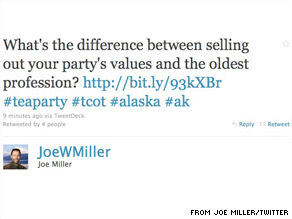 (CNN) - The campaign for Alaska Senate candidate Joe Miller removed a tweet Friday from its Twitter page that suggested "the oldest profession" was comparable to the possibility his primary candidate, Sen. Lisa Murkowski, might "sell out" the Republican Party to run as a Libertarian Party candidate. The apparent reference to prostitution comes as Sen. Murkowski is down 1,680 votes and thousands of absentee ballots have yet to be counted in Tuesday's surprise cliff-hanger race for the Republican nomination. "What's the difference between selling out your party's values and the oldest profession?" the tweet read. (CNN) - Primary voters are set to head to the polls this weekend, this time in Louisiana and West Virginia. In Louisiana, GOP Sen. David Vitter is expected to easily overcome a primary challenge Saturday in his first appearance on the ballot since a 2007 prostitution scandal. In West Virginia, voters are choosing the Democratic and Republican nominees for a November special election to replace the late Sen. Robert Byrd, a Democrat. Vitter is being opposed in the Republican primary by former state Supreme Court Justice Chet Traylor and Nick Accardo. Tulane University political science professor Brian Box said after Traylor's last-minute entry into the race, "it seemed like it could be an interesting primary."